With iMazing, you can easily save your voicemail as an audio file, to your computer or to an external drive. Anyone who wants to easily save or backup voicemail to their computer or to an external drive. In the left sidebar, select Phone > Voicemail. To view your most recent data, you may need to refresh your data. Select the contact(s) whose voicemail you want to export. By default, iMazing will export all the voicemail from the selected contact(s). If you only want to export specific voicemail, select them now. In the bottom toolbar, click Export. This will open a save panel dialog box. In the dialog box, select where you want to export your files, then click Choose. Use the CTRL/Command or SHIFT keys to select multiple contacts or voicemail. Double-click your voicemail to preview it. iMazing's Voicemail view includes a Transcript column. It features transcriptions of the voice messages as done by iOS. However, transcription is only available if the voice of the person leaving the voicemail is clear and in the same language as your iPhone's. Transcripts availability also depends on your carrier.  Tip: Transcripts will often be too long to be displayed in iMazing, but they will be fully available if you use iMazing's export CSV function. Visual Voicemail is an an optional feature which enables viewing voicemail directly on your device, without dialling a mailbox. Not all carriers support Visual Voicemail: if your voicemail does not appear on your iPhone, please check this Apple Support article. 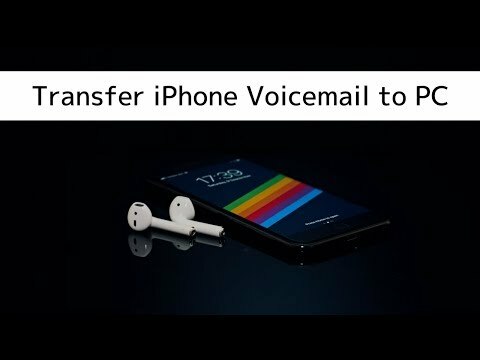 If you want to transfer your voicemail to a new iPhone, you'll need to create a backup of the old phone, then restore that backup to the new iPhone. Voicemail audio files are in .amr format. If you are a Windows user, you will need Apple's Quicktime or VLC to play .amr files on your computer.